Mehboob Khan's Mother India (1957) is Hindi cinema's seminal epic about a grassroots-level Indian family whose fate forever hangs on the caprice of several obdurate forces. As the film's publicity said: "The grain of rice on your table does not tell the grim tale of the toil that grew it." This story is woven into a film with raw emotion and cinematic finesse. Mother India (played with incredible warmth by Nargis) is an allegory for Mother Earth who gives endlessly of herself yet demands obeisance to certain laws. The film was a through-the-roof blockbuster. Radha, a shy, young bride comes into Shamu's (Raaj Kumar's) house only to learn from her mother-in-law (played by silent-era star Jilloo) that her husband's land lies mortgaged. Radha and Shamu toil ceaselessly, but the leery Lala (Kanhaiyalal) waltzes off with more than his pound of flesh. Desperate, Radha suggests cultivating a barren, rocky piece of land. But their precious bullock dies in the effort. An all-out catastrophe follows when Shamu's hands are crushed while working. Taunted by Lala and unwilling to be a burden, Shamu leaves home, leaving Radha searching frantically for him. There is no reunion between Nargis and Raaj Kumar (even a man of letters like Rajinder Singh Bedi succumbed to this when he made Waheeda and Dharmendra reunite in Phagun). This deeply underscores Radha's tragedy. With mouths to feed and no option but to survive, Radha tills the land herself. A chain of tragedies and a devastating flood dash all her hopes. Radha rebuilds her life from scratch each time, and becomes a living totem of strength, love and willpower for her village and her children. Ramu is the quiet, sturdy elder son; Birju (played when young by an endearing Sajid Khan) is a cannonball of mischief. The two exhibit these traits when they grow up (Rajendra Kumar and Sunil Dutt). Times mellow, the village celebrates the harvest with song and dance. And perhaps Radha can now harvest the fruits of her years of hard labour. The film now showcases a profusion of starlets pirouetting in a string of colourful songs. The village Venus, Champa (Kum Kum) marries Ramu. There's the docile, doe-eyed Chandra (Azra), and the Lala's coquettish daughter Roopa (played with flair by Madhubala's real-life sister, Chanchal) who delights in teasing Birju in an undefined relationship. Birju, the rebel, has major chips on both his shoulders about Lala's injustices and becomes a brigand. Radha's maternal love helps him escape a blazing fire started by Lala but even Radha can't save him from himself. He kidnaps Lala's daughter. And Radha is forced to replicate Mother Earth's response to those who violate her laws. Nargis was only 28 when Mother India was released but hers was the performance of a lifetime -- from a young bride with painted eyebrows to a matriarchal figure who doesn't seem to even run a comb through her hair. Her unique ability to portray strength of purpose (at a time when most heroines were marshmallow-soft) made her perfect for the role. Yes, Radha is also overidealised. But it was important to do so else the story might not have worked otherwise. Raaj Kumar leaves a lasting impact in a brief but pathos-laden role. Rajendra Kumar portrays the robust Indian farmer and provides the ideal foil to Sunil Dutt's unruly nature. Dutt is pure, unharnessed energy as the rebel. Mother India is fragrant with the loamy soils of rural India. And director Mehboob Khan takes the character's Darwinian struggles and turns it into a celebration of human spirit instead of an elegy. * Mother India was Nargis' big chance to prove she could deliver hits outside the Raj Kapoor ambit. It was one of the first films she signed after working exclusively with Kapoor for half a decade. Incidentally, Mehboob introduced Nargis as heroine with Taqdeer (1943). 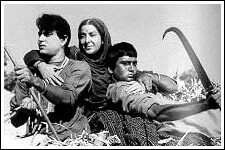 * For Raaj Kumar, Sunil Dutt and Rajendra Kumar Mother India was their first major success. * Mehboob Khan had already made an acclaimed film on the same subject -- the black-and-white Aurat in 1940 with Sardar Akhtar in the lead role with Yakub and Surendra. That Khan started life in a small village in Gujarat contributed to the authenticity of village life in both films. * Hollywood star of Indian origin Sabu (Elephant Boy) was to play Sunil Dutt's role originally. * Sunil Dutt famously saved Nargis during the fire sequence. Nargis was shown trapped inside a raging fire while Sunil Dutt jumps in and saves her. But the blaze roared out of control leaving Nargis stranded. Sunil Dutt quickly grabbed a blanket and plunged inside and, wrapping the blanket around themselves, the twosome ran out. It meant several, painful burns for Sunil but it also resulted in Nargis falling in love with him. They were married within a year. * Buoyed by Mother India's success, Khan called his next film, Son Of India, starring little Birju, Sajid Khan. The film bombed at the turnstiles. * In a one-of-its kind cinematic tribute, Dev Anand is shown selling tickets of Mother India in black in Kaala Bazaar (1960). * The Mehboob-Naushad combination had already spun some unforgettable melodies in Anmol Ghadi, Andaaz, Aan and Amar (the last two with lyricist Shakeel Badayuni). Mother India's music, unfortunately, was not in the same elevated class. * There are compensations in Lata's deeply-felt rendition of Shakeel's well-written Duniya mein hum aaye hain toh jeena hi padega, jeevan hai agar zaher toh peena hi padega. Naushad is still (somewhat) faithful to his onetime favourite Shamshad: Her O gaadiwale gaadi dheere haank re shows the singer in a mood as infectiously spirited as ever.